Draft Legal racing has arrived and so has your chance to race like the pros and be crowned a British Champion! The Accenture World Triathlon Mixed Relay Nottingham is proud to announce it will host the 2019 British Triathlon Sprint Distance Triathlon Championships, bringing together some of the country’s top age-group talent in a race for victory. On Saturday 15 June 2019, as well as the greatest triathlon quartets in the world going head to head, the best of British amateur talent will also be finishing across the same iconic blue carpet in front of Nottingham’s iconic War Memorial along Victoria Embankment. The British Triathlon Championship events do attract more experienced triathletes, but don’t worry though, if you’re a first timer or new to the sport, the open race (draft-illegal) is set to be a fun and accessible event for all ages and abilities to take part in and you can be assured that there will be plenty of other triathletes of a similar ability to you taking part. It is now confirmed that the British Sprint Triathlon Championships are draft legal. As part of your registration, you have opted to take part in either the open (non-drafting) waves or British Championship (now draft legal) waves. In recent years we have seen a shift in sprint distance triathlon towards draft legal racing. The ITU led the way with this transition and the ETU have recently followed suit. Gradually we are seeing more draft legal races domestically and thus continue to work with event organisers to provide additional opportunities to race in this format. 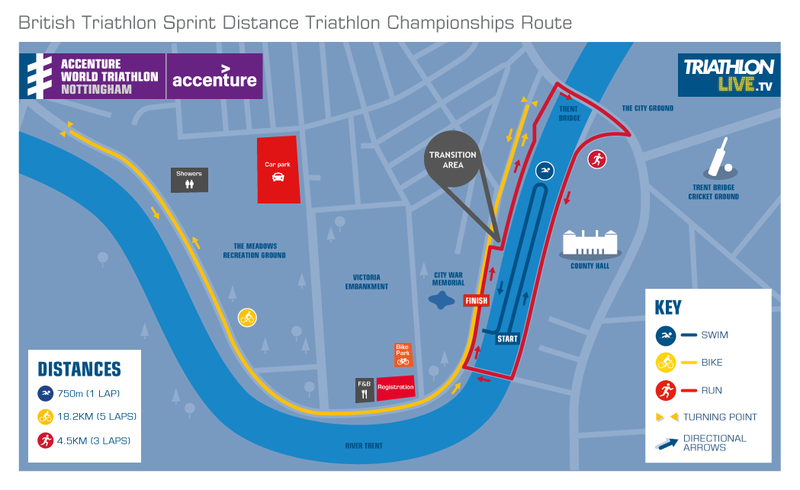 Since the release of the Championships and Qualifiers calendar last September, the Accenture World Triathlon Mixed Relay Nottingham has announced that the British Sprint Championships on the 15 June 2019 will also be draft legal to provide both an automatic qualification slot to the winner of each age group and a closed road draft legal bike course. If you are looking for a warm up event in which to practice your drafting skills before the World/European Championships, this would provide a perfect opportunity. For more information on Draft Legal Championships or if you have any other query about the event, get in touch with the team on nottingham@britishtriathlon.org. As per British Triathlon's Pre-Qualification Policy, you can qualify for the Great Britain Age-Group Team by winning the British Championships title in your age category over the equivalent distance. Find out more here.